Dr. Culver received his degree in Veterinary Medicine in 1983 from Iowa State University. He has been in small animal practice in the Des Moines area since 1987. Dr. Culver opened the Heartland Animal Hospital in July of 1995. Dr. Culver is a member of the American Veterinary Medical Association (AVMA), the American Association of Feline Practitioners (AAFP), the American Animal Hospital Association (AAHA), the Iowa Veterinary Medical Association (IVMA), and the Greater Des Moines Veterinary Medical Association (GDVMA). Dr. Culver resides in West Des Moines with his wife Mariann. They share their home with Missy the cat and Kirsi, their Petite Basset Griffon Vendeen (PBGV). Dr. Prescott received her degree in Veterinary Medicine in May of 2002 from Iowa State University. She joined The Heartland Animal team shortly after graduation. Dr. Prescott is a member of the AVMA, IVMA, GVDMA, and the Des Moines Golden Retriever Club. Dr. Prescott lives near Maxwell with her husband Jarad, daughters Hannah and Laura, their Golden Retrievers Piper and Tris, and their cats Doodle, Dexter, and Mouse. They also have a barn kitty, and several chickens and turkeys. Dr. Edel received her degree in Veterinary Medicine in May of 2015 from Iowa State University. She joined the Heartland Animal Hospital team shortly after graduation. Dr. Edel is a member of the AVMA, IVMA, and GVDMA. Dr. Edel resides in Ankeny with her husband Logan and daughter Peyton. They share their home with their cats Snickers and Zoey, and Bernese Mountain Dog, Tucker. Julie joined the Heartland Animal Hospital team in August of 2001. She earned an Associate's Degree in Science from Des Moines Area Community College in December of 2001. She completed the American Animal Hospital's Distance Education Program in Veterinary Technology in 2013, becoming a Registered Veterinary Technician after passing her board examinations and is a member of AAHA and CIVTA. Julie lives in Mitchelville with her husband, their cat Igby, Greyhound Guido, and rescued Shiba Inu Enishi. Angela joined the Heartland Animal Hospital team in November of 2012. She earned her AAS degree in Veterinary Technology and became a Registered Veterinary Technician after passing her board examinations in 2012. She is a member of the Central Iowa Veterinary Technician Association (CIVTA). Angela resides in Des Moines with her daughter, Hayley along with their two cats; Mr. Bigglesworth and Daisy and German Shepherd, Zena. Mashell joined the Heartland Animal Hospital team in April of 2017. She earned her Associates of Applied Science degree in Veterinary Technology and obtained a Veterinary Assisting degree. After passing her national and state examinations, she became a Registered Veterinary Technician in Iowa. She is a member of the National Association of Veterinary Technicians (NAVTA). Mashell lives in Des Moines with her rescued German Shorthair Pointer Mari and painted turtles, Freddy and Bubba. Jennifer joined the Heartland Animal Hospital team in September of 2018. 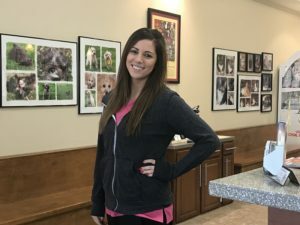 She has a Bachelor's degree in Biology from Iowa State University and recently graduated with an AAS in Veterinary Technology from Des Moines Area Community College. 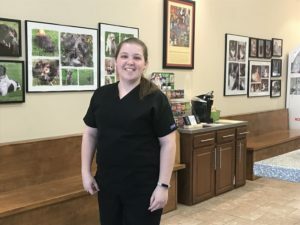 She became a Registered Veterinary Technician in 2018 after passing her board examinations. Jennifer lives in Ames with her cat, Clementine. Michelle joined the Heartland Animal Hospital team in September of 2006, shortly after relocating to Iowa from New York. She has a Bachelor's degree in English and Political Science. Michelle lives in Des Moines with her husband, his two sons, rescued Labrador Big John, Terrier Mix Nug, and cats; Ray and Dexter. JoElle joined the Heartland Animal Hospital team in February 2018. She has worked in the veterinary field for six years and has taken some continuing education classes to become a veterinary assistant. JoElle lives in Des Moines with her two dogs, Tito and Nala and cat, Gracie. April joined the Heartland Animal Hospital team in April of 2009. She has earned a Bachelor's degree in General Studies from Central College. April lives in Des Moines with her husband, and their cats; Zombo, Robot, and Ducky. Dani joined the Heartland Animal Hospital team in November 2016. She has been a veterinary assistant since 2009. She has taken numberous continuing education classes over the years to expand her knowledge in veterinary medicine. Dani lives in Des Moines with her wife Andria and son, Liam along with their dog, Smokey. Melissa joined the Heartland Animal Hospital team in December 2015. She has a Bachelor's degree in Animal Science from the University of Illinois. She has been a veterinary assistant since 2000. She enjoys spending time with her cats, reading and kayaking with her husband.